Ordinary British and German soldiers in France’s muddy frontline trenches led the legendary Christmas Eve truce of 1914. Shooting at the Stars brings this event to vibrant life for younger children, while giving older children and adults historical details that make the tale all the more poignant. This story, told through a fictional young British soldier’s simple sketches and letters home make this picture book more than special. Seeing the mud, the rats and the misery as drawn by someone who might have been there makes everything seem more real. John Hendrix shows us the magic that happened on that miraculous Christmas Eve through his masterful crafting of both both word and illustration. Seeing soldiers climb out of the trenches and walk across the mud of No Man’s land to shake hands, trade buttons and play biscuit-tin soccer with their enemies is something you’ve got to see to believe. Shooting the Stars: The Christmas Truce of 1914 will be at the top of the pile of my most treasured Christmas tales from now on. 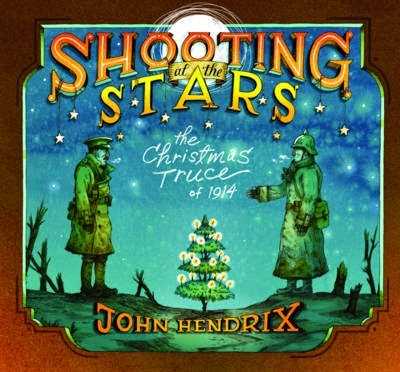 Title: Shooting at the Stars: the Christmas Truce of 1914. What a great book. I have seen they made an Christmas advertisement in Britain this year using this momentous occasion. To have this delightful book to read to the class is an added bonus. Merry Xmas.